Since I’ve been asked this question twice in one month, I figure it’s worth writing a blog post about. With the price of LCD and LED TVs dropping daily, many companies have decided to mount large flat-screen TVs to their conference room walls to use for presentations. It’s a great idea, but it does raise the question, What is the best way to hook up your computer to the TV? Various other proprietary connections that require proprietary adapters. Since HDMI is the most ubiquitous of the standards, and since most of the other standards can be converted to HDMI, and since your TV likely has multiple HDMI inputs, your best bet is a long HDMI cable and a few adapters that allow you to plug in a variety of devices. 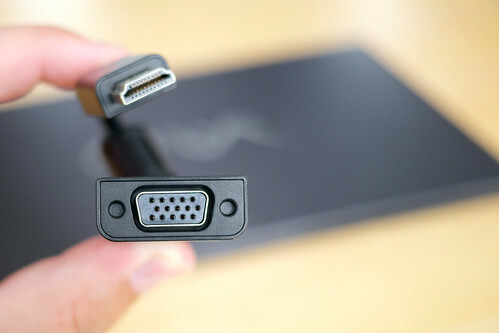 At the very least, you should have, on-hand, a DVI-HDMI adapter. If you have guests who would like to present, it’s wise to ask them a few days in advance what style video outputs they have, so you can purchase the necessary adapters or converters prior to their arrival. Why not just ditch all these cables and go wireless? After all, it’s 2014. Aren’t we supposed to be able to do that now? Well, we’re also supposed to have flying cars, and while there are a few contenders for that title, there’s no consensus or standardization of what a flying car should be. It’s the same with wireless video: There are quite a few technologies that allow you to send video to a monitor without wires, but there’s no standardization. The problem is that most of the devices require special drivers to be loaded on the computer to allow it to use the device. That’s fine if you’re always connecting the same computer, but the drivers may not be compatible with whatever computers your guests bring in. And, who wants to spend the first twenty minutes of their presentation downloading and troubleshooting drivers? In conclusion, the best option is a single HDMI cable with adapters. This will present the least problems and be the most compatible. If you must go wireless, make sure you use a system where the transmitter and receiver are both connected via HDMI.